A blistering deal for a round that usually cannot be found in such a great configuration (reloadable brass and boxer primed. Sure this isn’t the ridiculously cheap stuff you can find with a steel case and Berdan priming, but it’s incredibly clean shooting, quality brass, and a perfect replacement for guns that are utilizing tighter tolerances than the AK/clones. With the increased amount of firearm platforms that have adopted the proven 7.62x39mm round, this cartridge is a wonderful option for the newer, tighter tolerances built into these bolt guns and AR/clone uppers. 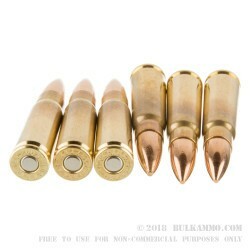 The 124 grain projectile is the standard loadout and offers very good ballistics for medium to (smaller) large game if the FMJ is suitable for hunting in your state. The low fouling, non corrosive build of this cartridge gives you an alternative to surplus rounds that aren’t nearly as accurate, clean or easy on your rifle. 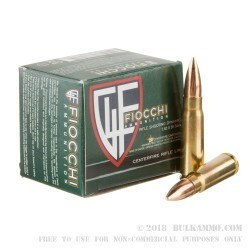 Fiocchi has been producing quality ammunition for 130+ years; this Italian maker has a reputation for low priced, high quality ammunition that is exceptionally reliable. Suitable for use in all firearms chambered for 7.62x39mm. A: Hello! 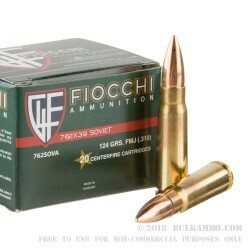 This Fiocchi ammunition is loaded in a brass casing with a boxer primer. You will have no issues reloading this brass. Q: I was also looking at the very inexpensive Tula 7.62 x 39... Why is Fiocchi so much more expensive? is it because of accuracy? Thanks in advance! A: Fiocchi 7.62x39 ammunition is loaded with brass cases and copper full metal jacketed bullets in northern Italy. These factors incur high material and labor costs, as well as environmental cleanup fees. Tula 7.62x39 ammunition is loaded with inexpensive steel cases and bi-metal (copper and steel alloy) jackets in Russia, which has lower labor costs and lower environmental regulations. 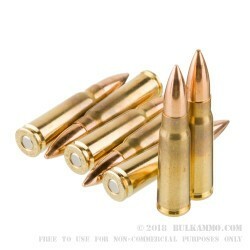 These have a direct effect on the cost of the ammunition.